No controlled trials of therapy for relapsing polychondritis (RP) have been published. The goal of treatment is to abate current symptoms and to preserve the integrity of cartilaginous structures. The mainstay of treatment is systemic corticosteroid therapy. Prednisone (20-60 mg/d) is administered in the acute phase and is tapered to 5-25 mg/d for maintenance. Severe flares may require 80-100 mg/d. Most patients require a low daily dose of prednisone for maintenance; however, intermittent administration of high doses during only flares of the condition is successful in rare cases. McAdam et al found that continuous prednisone decreased the severity, frequency, and duration of relapses. See the images below. Same patient as in Image 5 after 4-6 weeks of steroid treatment. Note resolution of auricular inflammation with nodularity and forward listing of the ears. Courtesy of the University of Washington, Division of Dermatology. Close-up view of same patient as in Image 6. 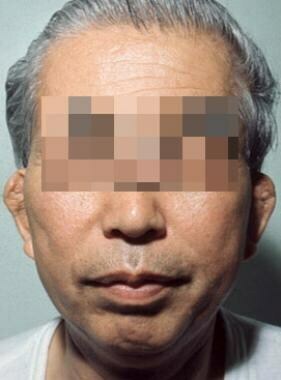 Forward flopping of ear with nodularity after steroid treatment. Courtesy of the University of Washington, Division of Dermatology. Other medications reported to control symptoms and, perhaps, progression of the disease, include dapsone (25-200 mg/d), azathioprine, methotrexate (MTX; 7.5-22.5 mg/wk), cyclophosphamide, and cyclosporine. MTX has been dosed beginning at 7.5 mg/wk, increasing up to 22.5 mg/wk in conjunction with steroid administration and has been found to significantly decrease corticosteroid requirements while controlling symptoms. Orally administered nonsteroidal anti-inflammatory drugs (NSAIDs) have not been effective. Medical care must include assessment for and treatment of other confounding or concurrent autoimmune disorders. The benefits of any proposed surgery must be weighed adequately against the patient's risk for infection, especially in the event of acute relapse, since patients are at an increased risk of infection whether or not they are using corticosteroids. Additionally, patients with relapsing polychondritis and tracheal disease may be at particular risk regarding complications resulting from tracheal intubation and extubation. Dermatologists or specialists in infectious diseases are often involved early in the course of the disease to evaluate the patient for infectious causes of cellulitis or perichondritis. Rheumatologists usually become the primary care provider and should be involved early in patient care. Ophthalmologists should also be involved early to diagnose, monitor, and treat the potentially devastating ocular complications. Cardiologists, neurologists, nephrologists, and otolaryngologists may be asked to manage other aspects of relapsing polychondritis. Plastic surgeons can aid in nasal reconstruction if saddle-nose deformity is present. Borgia F, Giuffrida R, Guarneri F, Cannavò SP. Relapsing Polychondritis: An Updated Review. Biomedicines. 2018 Aug 2. 6 (3):539-43. [Medline]. [Full Text]. Jaksch-Wartenhorst R. Polychondropathia. Wien Arch F Inn Med. 1923. 6:93-100. Pearson CM, Kline HM, Newcomer VD. Relapsing polychondritis. N Engl J Med. 1960 Jul 14. 263:51-8. [Medline]. Childs LF, Rickert S, Wengerman OC, Lebovics R, Blitzer A. Laryngeal Manifestations of Relapsing Polychondritis and a Novel Treatment Option. J Voice. 2011 Nov 12. [Medline]. Arnaud L, Mathian A, Haroche J, Gorochov G, Amoura Z. Pathogenesis of relapsing polychondritis: a 2013 update. Autoimmun Rev. 2014 Feb. 13(2):90-5. [Medline]. Foidart JM, Abe S, Martin GR, et al. Antibodies to type II collagen in relapsing polychondritis. N Engl J Med. 1978 Nov 30. 299(22):1203-7. [Medline]. Hansson AS, Heinegard D, Piette JC, Burkhardt H, Holmdahl R. The occurrence of autoantibodies to matrilin 1 reflects a tissue-specific response to cartilage of the respiratory tract in patients with relapsing polychondritis. Arthritis Rheum. 2001 Oct. 44(10):2402-12. [Medline]. Ebringer R, Rook G, Swana GT, Bottazzo GF, Doniach D. Autoantibodies to cartilage and type II collagen in relapsing polychondritis and other rheumatic diseases. Ann Rheum Dis. 1981 Oct. 40(5):473-9. [Medline]. Tanaka Y, Nakamura M, Matsui T, et al. Proteomic surveillance of autoantigens in relapsing polychondritis. Microbiol Immunol. 2006. 50(2):117-26. [Medline]. Takagi D, Iwabuchi K, Iwabuchi C, Nakamaru Y, Maguchi S, Ohwatari R. Immunoregulatory defects of V alpha 24V+ beta 11+ NKT cells in development of Wegener's granulomatosis and relapsing polychondritis. Clin Exp Immunol. 2004 Jun. 136(3):591-600. [Medline]. Stabler T, Piette JC, Chevalier X, Marini-Portugal A, Kraus VB. Serum cytokine profiles in relapsing polychondritis suggest monocyte/macrophage activation. Arthritis Rheum. 2004 Nov. 50(11):3663-7. [Medline]. Buckner JH, Van Landeghen M, Kwok WW, Tsarknaridis L. Identification of type II collagen peptide 261-273-specific T cell clones in a patient with relapsing polychondritis. Arthritis Rheum. 2002 Jan. 46(1):238-44. [Medline]. McCune WJ, Schiller AL, Dynesius-Trentham RA, Trentham DE. Type II collagen-induced auricular chondritis. Arthritis Rheum. 1982 Mar. 25(3):266-73. [Medline]. Buckner JH, Wu JJ, Reife RA, Terato K, Eyre DR. Autoreactivity against matrilin-1 in a patient with relapsing polychondritis. Arthritis Rheum. 2000 Apr. 43(4):939-43. [Medline]. Lamoureux JL, Buckner JH, David CS, Bradley DS. Mice expressing HLA-DQ6alpha8beta transgenes develop polychondritis spontaneously. Arthritis Res Ther. 2006. 8(4):R134. [Medline]. McAdam LP, O'Hanlan MA, Bluestone R, Pearson CM. Relapsing polychondritis: prospective study of 23 patients and a review of the literature. Medicine (Baltimore). 1976 May. 55(3):193-215. [Medline]. Zeuner M, Straub RH, Rauh G, Albert ED, Scholmerich J, Lang B. Relapsing polychondritis: clinical and immunogenetic analysis of 62 patients. J Rheumatol. 1997 Jan. 24(1):96-101. [Medline]. Michet CJ Jr, McKenna CH, Luthra HS, O'Fallon WM. Relapsing polychondritis. Survival and predictive role of early disease manifestations. Ann Intern Med. 1986 Jan. 104(1):74-8. [Medline]. Trentham DE, Le CH. Relapsing polychondritis. Ann Intern Med. 1998 Jul 15. 129(2):114-22. [Medline]. Priori R, Conti F, Pittoni V, Valesini G. Relapsing polychondritis: a syndrome rather than a distinct clinical entity?. Clin Exp Rheumatol. 1997 May-Jun. 15(3):334-5. [Medline]. Piette JC, El-Rassi R, Amoura Z. Antinuclear antibodies in relapsing polychondritis. Ann Rheum Dis. 1999 Oct. 58(10):656-7. [Medline]. Haigh R, Scott-Coombes D, Seckl JR. Acute mastitis; a novel presentation of relapsing polychondritis. Postgrad Med J. 1987 Nov. 63(745):983-4. [Medline]. Cohen PR. Granuloma annulare, relapsing polychondritis, sarcoidosis, and systemic lupus erythematosus: conditions whose dermatologic manifestations may occur as hematologic malignancy-associated mucocutaneous paraneoplastic syndromes. Int J Dermatol. 2006 Jan. 45(1):70-80. [Medline]. Shimizu J, Kubota T, Takada E, Takai K, Fujiwara N, Arimitsu N, et al. Propionate-producing bacteria in the intestine may associate with skewed responses of IL10-producing regulatory T cells in patients with relapsing polychondritis. PLoS One. 2018. 13 (9):e0203657. [Medline]. [Full Text]. Kent PD, Michet CJ Jr, Luthra HS. Relapsing polychondritis. Curr Opin Rheumatol. 2004 Jan. 16(1):56-61. [Medline]. Letko E, Zafirakis P, Baltatzis S, Voudouri A, Livir-Rallatos C, Foster CS. Relapsing polychondritis: a clinical review. Semin Arthritis Rheum. 2002 Jun. 31(6):384-95. [Medline]. Sainz-de-la-Maza M, Molina N, Gonzalez-Gonzalez LA, Doctor PP, Tauber J, Foster CS. Scleritis associated with relapsing polychondritis. Br J Ophthalmol. 2016 Sep. 100 (9):1290-4. [Medline]. Dion J, Costedoat-Chalumeau N, Sène D, Cohen-Bittan J, Leroux G, Dion C, et al. Relapsing Polychondritis Can Be Characterized by Three Different Clinical Phenotypes: Analysis of a Recent Series of 142 Patients. Arthritis Rheumatol. 2016 Dec. 68 (12):2992-3001. [Medline]. Haslag-Minoff J, Regunath H. Relapsing Polychondritis. N Engl J Med. 2018 May 3. 378 (18):1715. [Medline]. [Full Text]. Hager MH, Moore ME. Relapsing polychondritis syndrome associated with pustular psoriasis, spondylitis and arthritis mutilans. J Rheumatol. 1987 Feb. 14(1):162-4. [Medline]. Le Besnerais M, Arnaud L, Boutémy J, Bienvenu B, Lévesque H, Amoura Z, et al. Aortic involvement in relapsing polychondritis. Joint Bone Spine. 2017 May 17. 37(7):1097-102. [Medline]. Bernard P, Bedane C, Delrous JL, Catanzano G, Bonnetblanc JM. Erythema elevatum diutinum in a patient with relapsing polychondritis. J Am Acad Dermatol. 1992 Feb. 26(2 Pt 2):312-5. [Medline]. Weinberger A, Myers AR. Relapsing polychondritis associated with cutaneous vasculitis. Arch Dermatol. 1979 Aug. 115(8):980-1. [Medline]. Astudillo L, Launay F, Lamant L, Sailler L, Bazex J, Couret B. Sweet's syndrome revealing relapsing polychondritis. Int J Dermatol. 2004 Oct. 43(10):720-2. [Medline]. Cohen PR. Sweet's syndrome and relapsing polychondritis: is their appearance in the same patient a coincidental occurrence or a bona fide association of these conditions?. Int J Dermatol. 2004 Oct. 43(10):772-7. [Medline]. Disdier P, Andrac L, Swiader L, et al. Cutaneous panniculitis and relapsing polychondritis: two cases. Dermatology. 1996. 193(3):266-8. [Medline]. Firestein GS, Gruber HE, Weisman MH, Zvaifler NJ, Barber J, O'Duffy JD. Mouth and genital ulcers with inflamed cartilage: MAGIC syndrome. Five patients with features of relapsing polychondritis and Behçet's disease. Am J Med. 1985 Jul. 79(1):65-72. [Medline]. Imai H, Motegi M, Mizuki N, et al. Mouth and genital ulcers with inflamed cartilage (MAGIC syndrome): a case report and literature review. Am J Med Sci. 1997 Nov. 314(5):330-2. [Medline]. Stewart SS, Ashizawa T, Dudley AW Jr, Goldberg JW, Lidsky MD. Cerebral vasculitis in relapsing polychondritis. Neurology. 1988 Jan. 38(1):150-2. [Medline]. Fujiki F, Tsuboi Y, Hashimoto K, Nakajima M, Yamada T. Non-herpetic limbic encephalitis associated with relapsing polychondritis. J Neurol Neurosurg Psychiatry. 2004 Nov. 75(11):1646-7. [Medline]. Ohta Y, Nagano I, Niiya D, Fujioka H, Kishimoto T, Shoji M. Nonparaneoplastic limbic encephalitis with relapsing polychondritis. J Neurol Sci. 2004 May 15. 220(1-2):85-8. [Medline]. Berg AM, Kasznica J, Hopkins P, Simms RW. Relapsing polychondritis and aseptic meningitis. J Rheumatol. 1996 Mar. 23(3):567-9. [Medline]. Chang-Miller A, Okamura M, Torres VE, et al. Renal involvement in relapsing polychondritis. Medicine (Baltimore). 1987 May. 66(3):202-17. [Medline]. Terao C, Yoshifuji H, Yamano Y, Kojima H, Yurugi K, Miura Y, et al. Genotyping of relapsing polychondritis identified novel susceptibility HLA alleles and distinct genetic characteristics from other rheumatic diseases. Rheumatology (Oxford). 2016 May 30. [Medline]. Labarthe MP, Bayle-Lebey P, Bazex J. Cutaneous manifestations of relapsing polychondritis in a patient receiving goserelin for carcinoma of the prostate. Dermatology. 1997. 195(4):391-4. [Medline]. Lee KS, Ernst A, Trentham DE, Lunn W, Feller-Kopman DJ, Boiselle PM. Relapsing polychondritis: prevalence of expiratory CT airway abnormalities. Radiology. 2006 Aug. 240(2):565-73. [Medline]. Yamashita H, Takahashi H, Kubota K, Ueda Y, Ozaki T, Yorifuji H, et al. Utility of fluorodeoxyglucose positron emission tomography/computed tomography for early diagnosis and evaluation of disease activity of relapsing polychondritis: a case series and literature review. Rheumatology (Oxford). 2014 Aug. 53(8):1482-90. [Medline]. Carter JD. Treatment of relapsing polychondritis with a TNF antagonist. J Rheumatol. 2005 Jul. 32(7):1413. [Medline]. Ratzinger G, Kuen-Spiegl M, Sepp N. Successful treatment of recalcitrant relapsing polychondritis with monoclonal antibodies. J Eur Acad Dermatol Venereol. 2009 Apr. 23(4):474-5. [Medline]. Richez C, Dumoulin C, Coutouly X, Schaeverbeke T. Successful treatment of relapsing polychondritis with infliximab. Clin Exp Rheumatol. 2004 Sep-Oct. 22(5):629-31. [Medline]. Seymour MW, Home DM, Williams RO, Allard SA. Prolonged response to anti-tumour necrosis factor treatment with adalimumab (Humira) in relapsing polychondritis complicated by aortitis. Rheumatology (Oxford). 2007 Nov. 46(11):1738-9. [Medline]. Wendling D, Govindaraju S, Prati C, Toussirot E, Bertolini E. Efficacy of anakinra in a patient with refractory relapsing polychondritis. Joint Bone Spine. 2008 Oct. 75(5):622-4. [Medline]. Vounotrypidis P, Sakellariou GT, Zisopoulos D, Berberidis C. Refractory relapsing polychondritis: rapid and sustained response in the treatment with an IL-1 receptor antagonist (anakinra). Rheumatology (Oxford). 2006 Apr. 45(4):491-2. [Medline]. Handler RP. Leflunomide for relapsing polychondritis: successful longterm treatment. J Rheumatol. 2006 Sep. 33(9):1916; author reply 1916-7. [Medline]. Kemta Lekpa F, Kraus VB, Chevalier X. Biologics in Relapsing Polychondritis: A Literature Review. Semin Arthritis Rheum. 2011 Nov 7. [Medline]. Liu L, Liu S, Guan W, Zhang L. Efficacy of tocilizumab for psychiatric symptoms associated with relapsing polychondritis: the first case report and review of the literature. Rheumatol Int. 2016 Jun 3. 19 (6):46-50. [Medline]. Moulis G, Pugnet G, Costedoat-Chalumeau N, et al. Efficacy and safety of biologics in relapsing polychondritis: a French national multicentre study. Ann Rheum Dis. 2018 Aug. 77 (8):1172-1178. [Medline]. Wierzbicka M, Tokarski M, Puszczewicz M, Szyfter W. The efficacy of submucosal corticosteroid injection and dilatation in subglottic stenosis of different aetiology. J Laryngol Otol. 2016 Apr 27. 1-6. [Medline]. Auricular edema and erythema sparing the lobule. Courtesy of Gregory J. Raugi, MD, PhD. 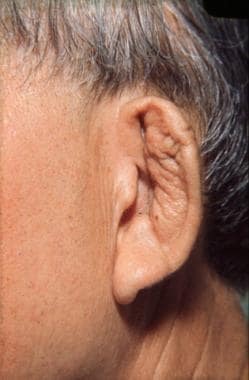 Severe auricular edema and inflammation. Courtesy of the University of Washington, Division of Dermatology. Forward listing ear. Courtesy of the University of Washington, Division of Dermatology. Floppy ear. Courtesy of the University of Washington, Division of Dermatology. Bilateral inflammation and structural collapse of the auricles in a patient found to have aortic dissection. Courtesy of the University of Washington, Division of Dermatology. Unilateral episcleritis. Courtesy of Gregory J. Raugi, MD, PhD. Saddle-nose deformity. Courtesy of the University of Washington, Division of Dermatology. Tracheal stenosis on chest x-ray film. Courtesy of Julie E. Takasugi, MD. *Individual patients may carry more than one autoimmune diagnosis.